should you? In this post, we shortlist the 15 best over-ear headphones under 100 dollars. In the past, the trend was that price bred quality. But manufacturers have been breaking the paradigm lately with affordable products that can compete with the high-end ones. This is a great way to disrupt the market and get customers excellent value for the money. We have selected products for our list from the same pool. It is varied and versatile and spread across both music and styles tastes. Read our latest guide about the best over-ear headphones under 200. 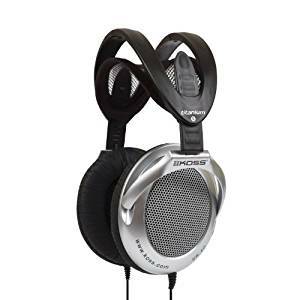 Are budget headphones any good? This used to be a one-sided debate until recently. Expensive headphones used to be ‘definitely’ better than the affordable ones. But this trend has been challenged by many new players like Edifier and Mpow and established brands like Philips in the headphone market. 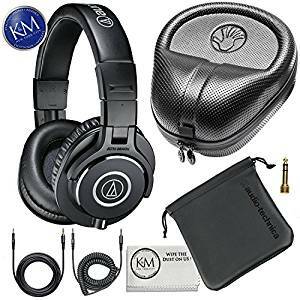 They have debuted some very capable headphones that can compete with the pricier models as long as you can compromise on premium styling or some extra accessories. The major factor that remains same is sound quality. Read our complete guide about the best headphones under 50. Sound Quality: Audio quality is the major bone of contention between affordable and pricey headphones. The expensive ones tend to have better bass definition, sub bass extension and generally good detailing overall. If you are a casual music listener, you might not have the ear to distinguish the ‘details’ that audiophiles keep talking about. You will have a perceived amount of clarity beyond which you might not ‘hear’ more details. This can be easily satisfied within this budget. Especially with studio headphones like Sony MDR7506. We recommend checking multiple headphones in this price range to find the one that provides the best clarity vs. price balance for you. and orchestral music are best played on neutral headphones. 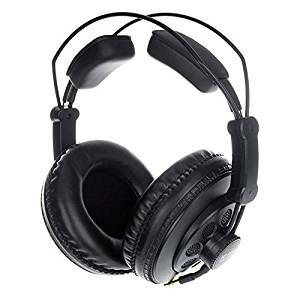 For studio monitoring, a neutral headphone with moderately bright treble would bring more clarity to the sound. 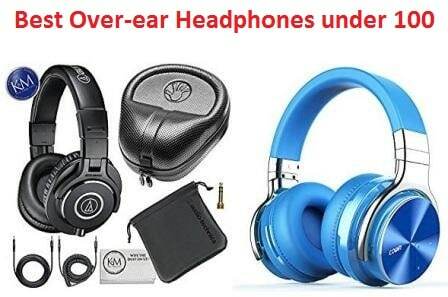 Usually we prefer selecting a neutral headphone because their sound signature can be EQ’d according to your tastes. It wipes and slate clean and allows you to modify the audio without losing any details. Comfort: If you spend a lot of time with the headphones on, comfort of using them becomes a major concern. Over-ear headphones tend to be generally comfortable since they sit around the ears and do not cause any pressure point. Consider the clamp pressure, the earpads, depth of the earpads and fitment while evaluating the comfort of the headphones. You get a real idea of how comfortable a headphone is once you’ve worn it for 1-2 hours continuously. Build: Within a 100-range, we always look for function over form unless some headphone is particularly dorky. The design should be made of high-impact plastics or should at least be reinforced with metal in key areas. This ensures that they don’t break on you with regular use. No matter how small the cost be, these headphones should honor the price with a lasting build. Portability: Under 100 over-ear headphones will mostly be purchased for daily use. So it really helps if they have features like foldability, wireless connectivity or at least detachable wires. 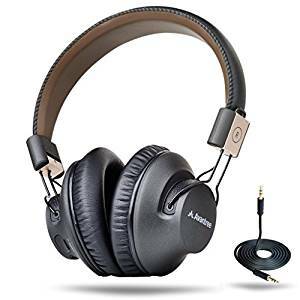 Bluetooth connectivity is a dicey criterion here because Bluetooth compresses audio quality and affordable headphones might not have any quality-enhancing protocols. Looks: Some of us prefer looks of the headphones over the build quality. If the durability and creaking of plastic is reasonable, the looks become a deciding factor for buying headphones under 100. Which are the best over-ear headphones under 100? Audio: We tried to select headphones with different sound signatures so that this list has something for everyone. However we checked that they offer excellent clarity for their price. We also checked that the bass doesn’t distort at high volumes or treble isn’t too harsh. Comfort: Comfort matters a lot to us since we spend a lot of time with headphones on. So we tested these headphones with hours of wear-time to see if there are any pressure points. We also figured out if common issues like clamp pressure can be corrected at home. Build quality: Most budget over-ear headphones tend to focus on sound and comfort. But durability is the pain point for most customers. So we checked back user feedback on these headphones to understand how long they last or whether they have any durability issues. Features: We looked for all the convenience that make them easier to use every day. This includes detachable cable and foldable arms for portability. Some of the best over-ear headphones under $100 are equipped with Bluetooth connectivity as well. Budget: We have selected all these headphones in the $25 to $100 range. They were compared based on their value for money rather than the absolute price. bring to mind the sound of their pricier Momentum 2.0 headphones with the convenience of wireless connectivity. The 4.40 opt for a low profile look and pump quality into everything else: sound, comfort and connectivity. Considering all of factors, these have all the hallmarks of being the top over-ear headphones under 100. The Sennheiser HD 4.40BT over-ear headphones go for the elegant and subtle looks that usually Bose headphones rock. They have large oval earcups. These are mounted with deep and soft earcups. Large ears can sit completely inside the earpads without sitting too close to the drivers. The earcups can swing forward bit and hug the ears for a snug fit. The headband is moderately thick with optimum padding. It weighs only 7.9 ounces so the low clamp pressure is enough to keep them stable on the head. Initially, you might find the headband creating certain pressure points. But with proper adjustment, you get the correct fitment and it fits effortlessly from then on. These budget over-ear headphones have on-board controls on the right earcup. These include a multipurpose button that can be used to play/pause music. It’s also a push switch which changes tracks by moving backward and forward. We like that track navigation has separate buttons. There’s a volume rocker right beneath it. It takes a few tries to familiarize yourself with all the buttons but it’s an easy learning curve. The back of the left earcups has an NFC zone for easy pairing. These wireless affordable headphones have both Bluetooth 4.4 and NFC support. The latest Bluetooth technology is both high quality and low-latency. Being NFC-enabled, they can connect instantly with another NFC device, all with a gentle bump. These run 25 hours on a single charge. That’s only beaten by Sony WH1000MX2. The 4.40BT come with an audio cable that connects to both earcups just in case the battery runs out. There are no inline controls on this though. 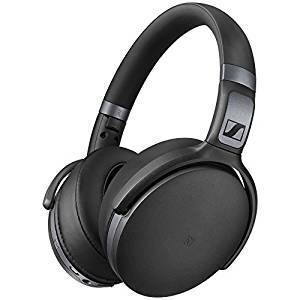 The Sennheiser HD 4.40BT over-ear headphones reproduce the classic Sennheiser audio that we love and do so over Bluetooth. This is a nicely balanced sound with an extra kick in the bass. Unlike other cheaper headphones, the 4.40BT pulls it off with a lot of panache. The mid-bass boost sounds very natural and does not muddy the mids. But it gives the lower frequencies some meatiness which make them sound fun with every genre. The bass is relatively fast too so it can handle mixes thick with various instruments. The vocals play clearly with crisp definition. They are supported by bass rather than having to compete with it. The thrum of strings is audible through the track. This partners with sparkly treble that lends more clarity to the audio. In spite of the bass-forward sound, the treble has excellent definition. The large earcups provide good noise isolation so you get better detailing through this too. The soundstage is good for a closed-back headphone. 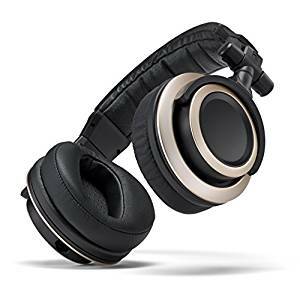 Cowin E7 Pro [2018 upgraded] over-ear headphones are one of those high value for money cans from a new brand. These pack all the features including ANC which make your life comfortable for everyday use. These are user-friendly and loaded with good battery life and thoughtfully selected design features. The audio is clear and detailed suitably for the casual listener. These deserve their top spot on the best over-ear headphones under 100 list. The Cowin E7 Pro over-ear headphones are the upgraded version of their E7 model. The cosmetic changes are few but marking. The earcups are round and one side has a silver backplate. The left backplate is done in black with a Cowin logo. The headband is moderately broad and padded thinly. It distributes the weight evenly over both ears and the head. The earcups are now mounted with earpads softer than the E7. These are both more durable and comfortable than the older version. They are sheathed in protein leather that lends a skin-like feeling to the pads. The earcups of these budget over-ear headphones swivel to fold flat. These can be easily hung around the neck. They are both Bluetooth- and NFC-enabled. NFC-pairing can be enabled by voice prompts too. The buttons are located along the rim of the left earcup. These include volume change and multifunctional controls. There’s an integrated microphone to make calls on the go. The E7 Pro is equipped with Active Noise Cancellation Technology to actively cancel out low-frequency noises like the airplane engine and the AC hum. This requires it to capture the noise via mics and run a signal in reverse to cancel the noise out. The battery of these headphones last through 30 hours per charge. When they run out of juice, they can be connected in a wired manner. The ANC works in both wired and wireless mode. These are available in white, red and black glossy designs. They come with a nice flat travel case and all the necessary wires for charging and listening to the music. The Cowin E7 pro over-ear headphones manage to hit the right balance with the anc. While the noise cancellation isn’t as eerily quiet as the Bose QuietComfort line. However, the ANC of E7 Pro eases out the low frequencies noise and some mid frequency chatter while allowing you to hear the conversation directed at you from a close range. This is useful while travelling when you want to shut out the random noises but want to hear the air hostess talking. The Bluetooth connection is strong. These headphones have high-definition powering a warm and balanced sound. While the bass extends well into the lower-frequencies, they aren’t boosted unnaturally. So the mids aren’t overwhelmed by the bass. The vocals get a clear and decently detailed representation. The highs are smooth. The bass doesn’t distort at high volumes. There’s no static from the Bluetooth connection. outfitted with all the main features like ANC, Bluetooth connectivity and comfortable fitment. These range of colors available is also alluring. This is a very affordable pair too, considering all the features it packs. It checks all the box for being on our list. The Mpow H5 budget headphones go for elegance over inexpensive glamour. The earcups are racetrack oval which are large enough to cover medium and large size ears. There are no pressure points on the ears. They are mounted with soft earpads with faux leather sheathing on the top. The ear pieces have some give which allow them to swing forward and hug your ears. The headband is moderately broad with light padding. The fitment is comfortable right off the bat. The arms of the headband twist and fold inwards. This reduces the overall footprint for portability. They are accompanied by a drawstring pouch as opposed to a semi-hard case that use to ship with them earlier. The controls are on the right earcup. These include an ANC button to power the feature on and off. The other on-board controls include track navigation and volume control buttons. The active noise cancelation feature cancels out the low-frequency sounds like the airplane engine noise and the AC hum. It does not cut out the vocals so you can hear people. The ANC is best suited for urban traffic, airplane travel and busy office. 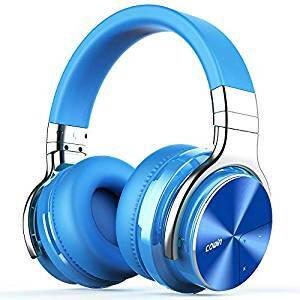 These affordable over-ear headphones connect wirelessly through Bluetooth v4.1. This has a range of 33 feet. The initial pairing process is slightly tedious. The battery lasts for 18 hours per charge. When the battery is drained, they can be used with an audio cable in a wired manner. These are available in black, red and silver color with a nice metallic finish. 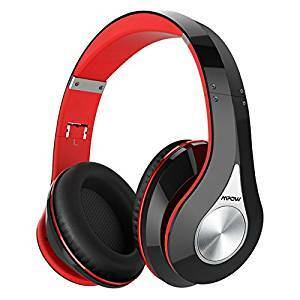 The Mpow H5 over-ear headphones deliver an energetic and bass-forward audio. They have a deep rumble in the bass frequencies with decent definition. The bass is not boomy, instead it has power and punch which makes it sound full even at low volumes. The Bluetooth connection stay steadfast without static. And ANC clears out the background clutter enable you to hear more details in the sound. The midrange is clear and without any muddiness. It gets a nice boost from the bass and the ANC. The treble is smooth and without any sibilance. These headphones are affordable so we didn’t have high hopes for the quality of their audio. But they surprised with the crisp and clear presentation inside a reasonably open soundstage. take a lot of abuse at the studio. 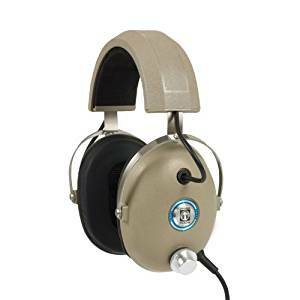 So you need a pair of sturdy cans with a neutral sound signature for monitoring. Enter Sennheiser HD280 Pro over-ear headphones. These are built like a tank with an accurate sound signature. If you are an audiophile or studio person, these are the best over-ear headphones under 100 for you. The Sennheiser HD280 Pro headphones are your true Plane Jane cans. Done entirely in black, the headband stretches dorkily. Yet, this ensures that the headband padding touches the head along the top of the arch. This gives you both proper support and soft contact. The earcups are large racetrack oval and completely cover the ears. They fit snugly since these are studio headphones and you require complete noise isolation with them on. The earcups have plush padding sheathed in pleather. The earcups can swing forward a few degrees and hug your head. The arms fold up to reduce the footprint of these headphones. The HD280 Pro over-ear headphones have a permanently fixed cable. This is a coiled cord which terminates in a 3.5mm jack. They come with a studio adapter for 6.3mm ports. The plastic used in the construction is sturdy and ready for some abuse. There’s no creaking when put them on move in them. Still, given their design, these aren’t meant for outdoor use. These area available in two bundles: one with the studio adapter alone and one with a headphone case. The Sennheiser HD280 Pro headphones are tuned for professional monitoring. They go for a highly accurate sound signature that delves into detailing than an energetic sound. The bass is punchy and very accurate. They sub bass content extends low and pumps definition into the lower frequencies. However, they may sound bass-light to a casual listener who has been exposed to bassy headphones throughout. But in the studio, this is an excellent trait since you can listen for irregularities in the recording. The midrange really shine without any interference from boosted bass. It brings out all the intricacies of the audio which helps spot the discrepancies in studio monitoring. The vocals are clean and musical. They don’t sound clinical, just clear. The treble is sparkly with just the right amount of bite. What really amazed us was the soundstage. For a closed-back headphone at this price, it’s very wide. This lends transparency and airiness to the sound and helps with instrument spacing as well. headphones make a successful splash in the market with the same mindset. These are wireless headphones with excellent noise isolation. These are highly portable with their space-saving design and Bluetooth connectivity. They double as a headset and check all the boxes for being one of best over-ear headphones under $100. The Mpow 059 Bluetooth headphones look much smarter than their price suggests. These have a curved headband on which both the earcups are mounted. The headband is done glossy black with red undersides. This is extendable on both sides. There are hinges right above the earcups at which the arms fold. This packs them down to half their original size. The earcups are large and racetrack oval. The driver is sheathed in mesh and the earcups are mounted with moderately deep memory foam earpads. These have a layer of protein leather covering them for comfort. The unique ensures they don’t stick out too much from the ears. There are on-board controls for playback and call management. These are available in 7 color combinations with black. These budget over-ear headphones connect via multipoint Bluetooth v4.1. You can connect up to 2 devices simultaneously and play audio from one based on priority. Voice alerts guide you through the pairing process. The wireless range extends to around 33 feet. There’s a microphone integrated with the unit to turn it into a headset. The mic quality is decent to make calls from a moderately noisy place. The 059 was updated in 2017 to reflect a 20-huour battery life instead of the 13-15 hour average before that. These can also work in a wired mode when the battery runs out. Mpow also back their products with a highly responsive customer support. 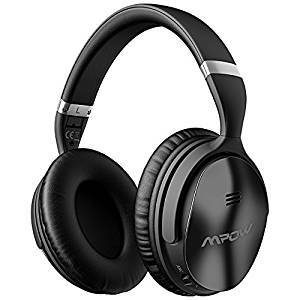 The Mpow 059 over-ear headphones are rather affordable to be critiqued from an audiophile point of view. But they deliver a punchy and clear sound signature even over Bluetooth. The wireless connection held strong without any static or dropouts. The earpads also provide above-average noise isolation which quietens the ambient noise and contributes to overall quality of the sound. The 059 offer good bass which has both reasonable definition and extension. It doesn’t distort at high volumes or sound boomy. At moderate volumes, they sound full instead of the tinny like other budget headphones. The vocals and strings are clear and well-supported by bass. There’s no harshness in the audio eve at high volumes. The sound signature is very well-defined for the price range and that’s why they have found strong popularity. are regarded as being more accurate than their popular M50x. These studio monitoring cans are a tough competition to Sony MDR7506 at a lower price. The sturdy build and detachable cables ensure their longevity and ease of use. The M40x is a prime candidate for the best over-ear headphones under 100. The ATH M40x unabashedly go for an all-plastic design. But they have used a high impact tolerance grade of plastic which can easily be pushed around in a studio. The design is elegant and somewhat sleeker than the M50x. The headband is moderately broad with optimal padding from ear to ear. The arms of the headband fold to pack these into a more compact package. The earcups swing forward to hug your head snugly. The backplates of the earcups have the classy Audio Technica logo in stark silver. The earcups are racetrack oval and close with only moderate clamp for proper fitment. The earcups swivel 90 degrees to stay flat which makes it easier to hang the M40x around your neck. One of the smartest design decisions of these affodable over-ear headphones is having detachable cables. That’s right, ‘cables’. They come with two purely audio cables. One is a coiled 3.5mm male-male cable. And the other is a straight version of the same. Owing to their studio monitoring nature, they are not equipped with inline control. Additionally, a soft pouch with provided to carrying them around. We would pay special attention to the fitment of these headphones since wearing spectacles is known to alter their bass performance. The Audio Technica M40x over-ear headphones outdo their price expectations with their audio performance. In essence, these are noticeably more neutral than the M50x which has a calculated mid-bass bump. The bass has excellent extension into the sub bass region and exceptional definition for the price. It makes it a pleasure to listen to these headphones even with the neutral signature. Owing to the tight bass, the midrange is clear and transparent. There’s absolutely not bass bleed to color the mids. So the vocals sound as natural and detailed as the price can muster. The treble has been smoothened to iron out the harshness. But it still has plenty of detailing and good extension. The optimized brightness in the highs makes the audio sound clearer and crisper. Although the audio imaging in bang and you can place the instruments sonically, the soundstage is clearly the size expected from a normal closed-back headphones. These aren’t as open-sounding as the big brother M50x. list. These wireless headphones redefine comfort and portability within and affordable budget. They make their design and audio investments smartly in Audition Pro. The end result is a pair best suited for daily use and everyday wear and tear, hence their place in the best over-ear headphones under 100 list. The Avantree Audition Pro AptX LL headphones go for a smart charcoal black design. The headband is moderately broad and padded from ear to ear. The design is highlight with uniform stitches in black. The earcup yokes are sinewy metal pieces. The earcups are racetrack oval and the backplate juts out a little. These aren’t as low profile as the flat Mpow 059. But they don’t look dorky either. The earcups are mounted with super soft cushions that hug the ears in comfort. The whole body weighs only 7 ounces, so once worn they almost feel like they aren’t present on your head. The playback controls and mic are integrated on to the design on the right earcups. But they don’t work in the wired mode. These affordable over-ear headphones connect wirelessly via Bluetooth or NFC. At version 4.1, these are coupled with a Low latency (LL) technology to reduce the lag between the source device and actual playback. So you will rarely find a lack of sync between the lip movement and the audio playback. The battery lasts for 40 hours per charge. It can also be used in the wired mode with the accompanying 3.5mm male-male cable. The yokes fold inwards to reduce the size of the headphones into half. They come with a hard carry case for portability. The Avantree Audition Pro AptX LL headphones are AptX-enabled as the name suggests. With another AptX source device, they provide better audio quality than standalone Bluetooth devices. They go for a balanced sound signature with a full and rich bass. Even at low volumes, these sound substantial so you can enjoy the bass. The audio sounds crisp and clean. The vocals are powered by a string bass but they aren’t muddied by the low frequencies. The highs have good definition and they lend more energy to the sound. The Low Latency feature also works extremely well. There’s no noticeable delay in the audio and video sync. They might have to work harder on sound leakage though. best over-ear headphones under 100, these fit the bill perfectly. 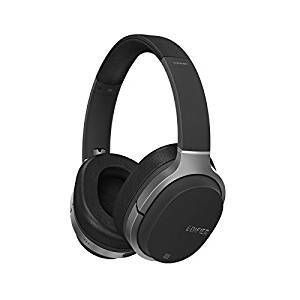 They are one of the most comfy designs on the list and he best over-ear open-back headphones we have tested at this price point. The brilliant headphones are quite durable too, as we found out from user feedback. The Koss UR40 over- ear headphones go for a black design with smart muted chrome earcups. The headband is of the suspension type. So there’s a slim self-adjusting air mesh headband which keeps the top of your head well ventilated. It also makes very soft contact with the arch of the head. The earcups themselves are connected by a slotted plastic band that allows your head to breathe. These have large oval earcups with a grille for the backplate. Being open-back, they leak sound and also bring in ambient noises. So these are best used for private listening. The earpad cushions have pleather sheathing for a soft sensation. These budget over-ear headphones weigh a little over 6 ounces. This relieves their need to clamp and makes the fitment very comfortable. The cable is permanently attached to the earcups and it’s double-sided. Being an older model, this is a pardonable disadvantage. The cable ends in a 3.5mm jack which is bent at 90 degrees for strain relief. The cord runs 4 feet long. The LyxPro HAS30 is a surprising yet rather attractive find for our best over-ear headphones under 100 dollars list. They look reasonably decent but they amaze with the balance of their sound. They have a very mature sound signature for their price. The clarity and sweetness of sound makes them immensely comfortable for listening to music over long hours. The modular design is portable and perfect for studio use. The Lyx HAS30 over-ear headphones, like M40x, are elegant but functional-looking. They don’t quite have the logo of Audio Technica though. They are made of tough plastic that can stand major abuse. The earcups are large racetrack oval. They are mounted with deep and plush earpads done in soft faux leather. They easily offset the weight of the headphone. The headband is broad and delivers the weight equally across the two earcups. These weigh 10.6 ounces. The key parts like the headband is reinforced with metal. The arms of the headband articulate to reduce their packing size. The earcups can also rotate 180 degrees and hug your ears for proper fitment. These budget over-ear headphones have detachable cables. They come with two 3.5mm male-male cable, one straight and one coiled. The coiled one has stress relief and is suitable for studio use. They come with a hard case with zipper closure. There’s a separate drawstring pouch for the cables as well. For such an affordable headphones, these come fully equipped. The Lyx HAS30 over-ear headphones definitely live up to their studio-grade reputation. They have the clean yet musical signature that make all genres sound fun. The balance is maintained consistently with different tracks. The bass is tight and punchy. They never overwhelm the mids but they beat with force. Even at low volumes, the audio never goes tinny or hollow. The midrange is clear and crisp. It’s right on point, not forward or recessed. The treble is smoothened to remove the harshness from the recordings. These over-ear headphones require 60-70hours of burn-in time to open up. The soundstage is restricted given these are closed-back headphones. For their price, they require minimal EQing. We recommend using good quality recordings with them, CD-quality or above. They might bring out the imperfections in lossy formats like MP3. similarities don’t end there. They have the same startlingly clear audio that makes us wonder if the expensive headphones are worth it. Their clarity and transparency land them in the best over-ear headphones under 100 list. The Superlux HD668B are semi open-back headphones. Like most audiophile gear, these are not suited for public use owing to the dorky design and low noise isolation. The large round earcups have small cutouts at the back with mesh peeking through. This gives the audio an open character which preserving some of the noise isolating character. These have a self-adjusting headband. The earcups are connected by a slotted metal bands. There are two separate cushioned arms that support them on the head. The earpads are optimal but could have been more plush. These affordable over-ear headphones have two detachable cables. One is 10-foot cord for studio use and the other a 3-foot one for portable use. A drawstring pouch and a 6.3mm adapter are also included for storing them safely. The construction is entirely plastic but unlike the Status Audio CB1, these feel more solid. The Superlux HD668B headphones stun you with their exceptional clarity at their small price tag. These are highly accurate in their audio presentation too. So what you get is audiophile quality audio where you can pick out any instrument from the mix sonically. The open back lends them a wide and large soundstage. The audio has the kind of airiness that closed-back headphones cannot reproduce. These headphones bring out the intricacies of the track very well. This is both a boon and a bane. While the good formats like FLAC sound beautiful, these can rip the lossy formats and imperfect recordings apart. These are much brighter the warm headphones we covered in this list. The treble can be a little harsh in treble-heavy songs, so we EQ it out. while maintaining the neutral status. On the other hand, users have had wildly different experiences with build quality. As a brand that prides itself for not showing off even with logos, they have invested well in their sound. We were suitably impressed with them and put them on our best over-ear headphones under 100. When you unpack the Status Audio CB1 headphones, you immediately notice that they aren’t marked by any logo. That’s because they invest in the design and get them manufactured by another vendor. The build is completely plastic and leatherette. There are no metal reinforcements at all, even in the extendable headband. The overall weight is only 8 ounces. The earcups are large and round. They are mounted with deep soft foam pads that angle forward for comfort. The headband is moderately broad and thickly padded. The arms of the headband have a spring-loaded rotation mechanism. These can be folded flat when they lie around your neck. These budget over-ear headphones come with 2 detachable cables. One is a 10-foot straight cable and another is smaller coiled cable. They lock deep into the earcup with twist-lock connectors and cannot be dislodged with a single tug. While we are satisfied with the features, there’s no doubt these aren’t as sturdy as Lyx HAS30 or Avantree Audition Pro LL. The Status Audio CB1 headphones have two very attractive qualities. They have minimal noise leakage and excellent noise isolation. So you can play music at high volumes without the fear of disturbing your neighbor. The large comfy earpads sit around the ears and isolate noise effectively. The CB1 go for a neutral and balanced signature. The bass, mids and highs play nice with each other for a natural audio reproduction. The bass has good definition and tight playback. They do not overwhelm the mids with their presence. The midrange is pretty detailed. They helped in studio use with their ability to bare the imperfections in the recording. The treble is smooth and well-extended. The element of note is the soundstage. For a closed-back headphone, these have unusually large and wide soundstage. headphones debuted over 30 years ago. While the design has gone from swanky to stagnant to antique, the audio was spot-on right off of the bat. These make a beeline for the best over-ear headphones under $100. The Koss Pro 4AA headphones weigh a mighty 19 ounces. So these are meant for people with large heads who can handle the weight. The frame and the earcups are made of steel and the bendy parts are made of rubber. The headband is padded ear to ear. The earcups are oval and mounted with soft foam earpads. They used to have liquid-filled earpads. But they turned out to be inconvenient and leaky. Now they just use the lightweight foam earpads. The headband can be extended to fit larger heads. Being an older budget over-ear headphone, the cable is permanently attached. Fortunately this is a single-sided cable so you have some moving-around space. This is a coiled cord that runs 8 feet long and terminates in a 6.3mm jack. 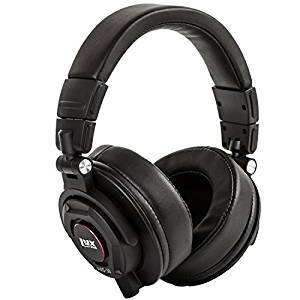 The Koss Pro 4AA headphones are high impedance headphones at 250 Ohms. They need an amp to function properly. That being said, it’s the pleasant and fun-sounding headphone that directly compete with ATH-M50x. If anything, the Koss Pro is warmer, fuller and richer. They are more laidback too. But they do not sacrifice their balance or clarity for the pleasant sound. These also go easy on the lossy formats like MP3 and make them sound smoother. The bass is tighter than the M50x so the Pro 4AA sound more natural and neutral. They also offer good noise isolation so the audio is more present. While they aren’t highly resolving. built to last in spite of the price. They are comfortable for long-term use. And sound much better than the price suggests. What more can we ask out of it. The Panasonic RPHT161K headphones look basic as one would expect. They have large round earcups. These are mounted with plush cushions sheathed in leatherette. The pleather sheathing will start to peel away with regular use. But the earpads themselves may survive for a couple of ears. The earpads also sit low-profile so that you don’t look dorky with these on. The earcups are connected by a slotted headband that allows the hair at the top of your head to breathe. These affordable over-ear headphones have a 6.5-foot cable. This is long enough for regular use but does not get in the way of portability. It ends in a 3.5mm jack. There are no extras with these headphones. But they are available in an on-ear model as well. 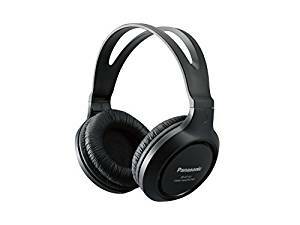 The Panasonic RPHT161K headphones are too affordable to be critiqued from an audiophile point of view. But they deliver more than expected. The sound clear and articulate. We played online games, YouTube videos and iPhone songs over them. All the media played with incredible clarity. There’s no boomy bass or distortion at low volumes. They can be worn for long hours without any sonic fatigue. attention. Their specs look too good to be true but they deliver on every promise. 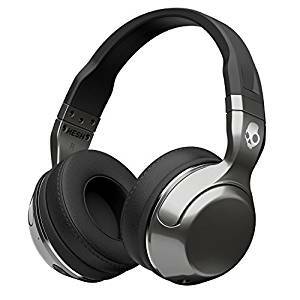 They are a complete package with comfort, battery life and audio packed into one of the best over-ear headphones under $100. The Edifier W830BT goes for a simple yet effective design. They have a matte black structure with mute metallic highlights on the yoke of the earcups. The headband is slim and padded along the arch. The earcups are large racetrack oval. They sit around the ears cushioning them in some deep earpads. The soft cushions are covered in synthetic leather for sensitive contact with the skin. The design is quite lightweight and the weight is distributed evenly for comfort. These affordable over-ear headphones can connect wirelessly through Bluetooth v4.1 or NFC. This is multipoint Bluetooth that can connect to two devices at a time and play based on priority. The most startling fact is that they last 95 hours per charge and standby of 1500 hours. They can also work on wired mode. The Edifier W830BT over-ear headphones go for a balanced signature with plenty of punch. The bass is tight and natural. It has a nice boost in the midbass area. The midrange is clean without any interference from the bass. The treble is smooth and has good definition. The audio is great independent of the genre. They played well with rock and jazz as much as they did with the dance music. from Skullcandy, they have a killer design that wow people with the cools looks. The Bluetooth connectivity helps snip the wires. All in all, a great choice for the best over-ear headphones under 100. The Skullcandy Hesh2 headphones maintain the elegant but grungy design that we have come to expect from the brand. The headphones are done in black or black+silver with the Skullcandy logo standing out against the stark background. The earcups are large and round-shaped. They aren’t as roomy as that of the typical Sony headphones so they are better suited for medium-sized ears. The earpads are sheathed in soft synthetic leather. The headband has a steel frame which adds to their durability. The headphones are finished in a silicone layer that prevents scuffs. These use Bluetooth to connect wirelessly to the source. The volume controls are available on board. These can also be used for track navigation. They last 15 hours on a single battery charge. When the charge runs out, they can be used in the wired mode. They have a mic integrated for using these as a headset. The Hesh 2 budget over-ear headphones go for a bass-forward warm sound. These have a pleasant sound signature with an energetic audio presentation. The bass rings powerful and meaty with a nice boost in the midbass. This gives the EDM and Techno songs a solid punch. The midrange is clear and articulate. It plays well with the bass to sound full and rich. The treble is smooth and never gets too harsh. These sound darker than the audiophile headphones like the Superlux HD668B. The noise isolation is adequate.